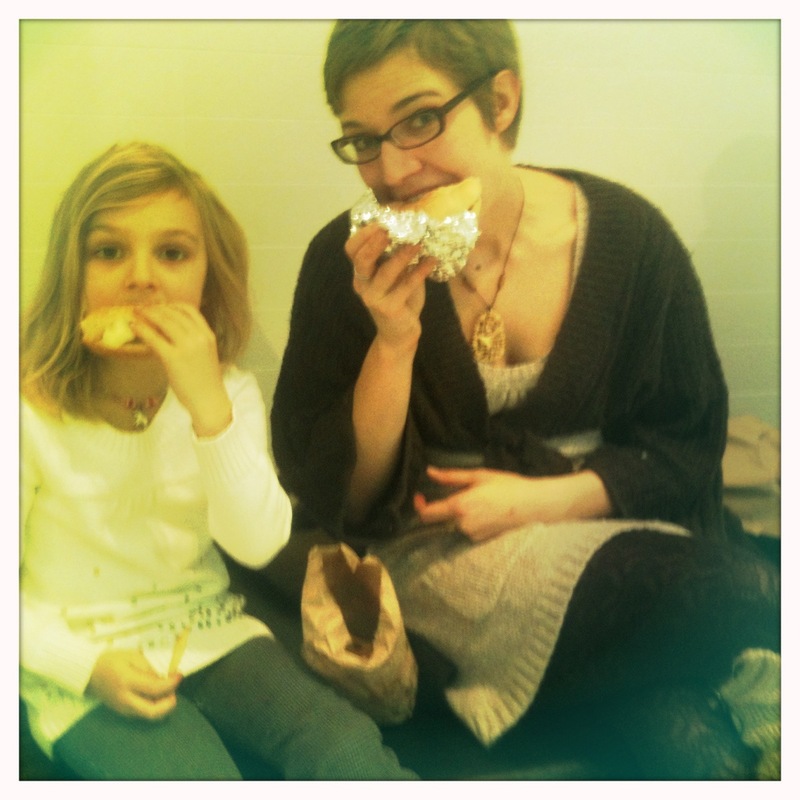 We don’t have much time for spontaneous family days in December (it’s true! 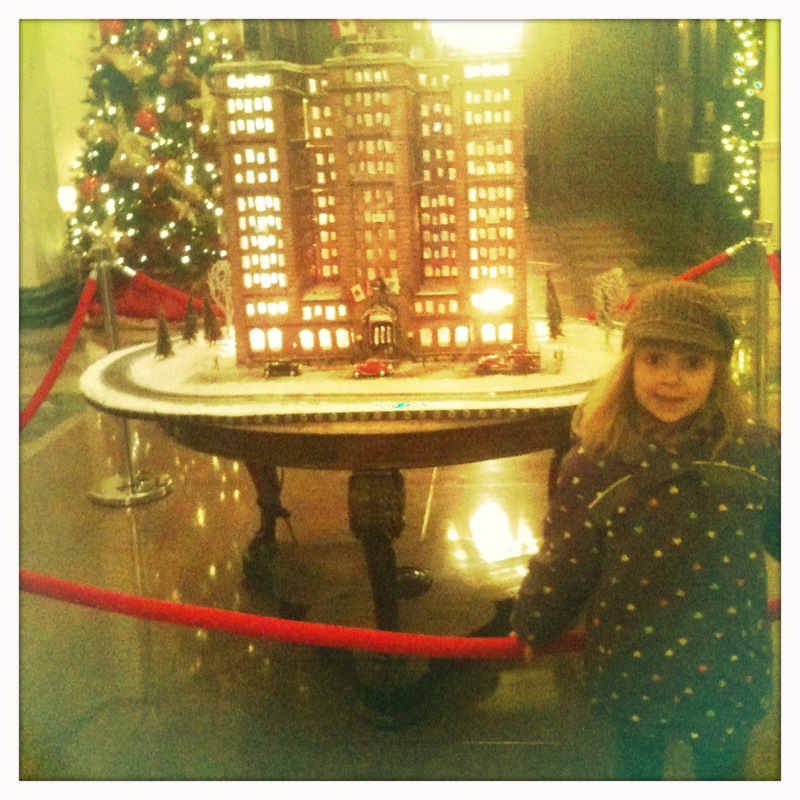 ), but I’ve been taking mental note of downtown festivities as I see them pop up on Facebook and Twitter – a gingerbread replica of the beautiful Fairmont Palliser Hotel, ice sculptures on Stephen Avenue, carolers, fiddlers, and pretty lights, to name a few. I had decided it would be fun to take an afternoon and head down there to enjoy as much as we could all in one day, since I knew making it down more than once wouldn’t happen. I looked up some of the attractions on advance and made it into kind of a scavenger hunt, so we could cross sights off the list as we went. We took to the +15 walkway system to get partway to TD Square, where we would find the fiddlers performing. 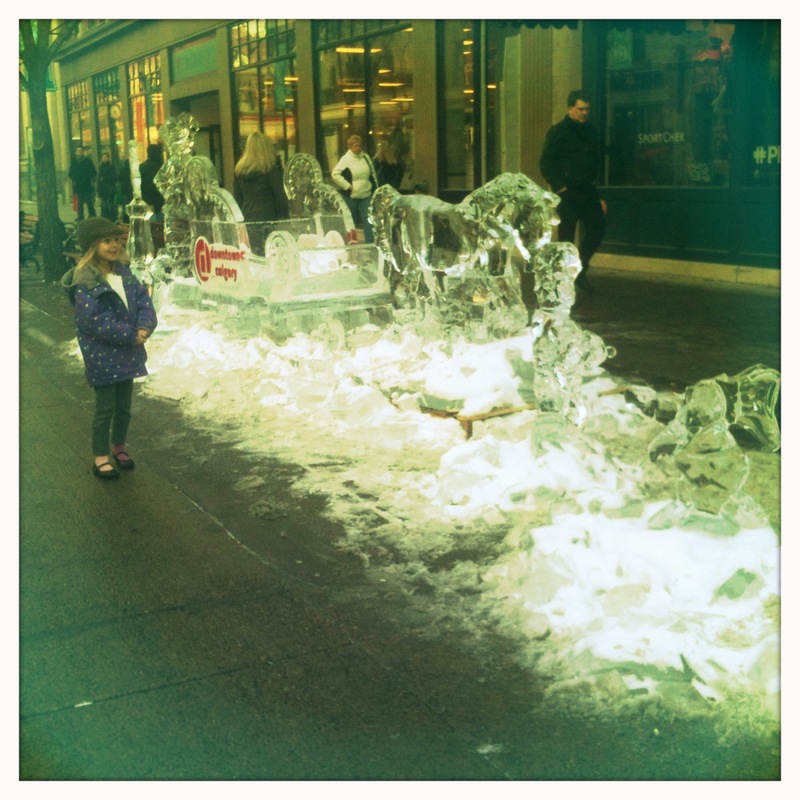 On our way, we walked for a bit down Stephen Avenue, and came across the ice sculptures in front of Winners. I hear that other years, they’ve been destroyed really quickly, so we were glad to see them still standing and in perfect condition. Unfortunately, even though the Downtown Calgary website said the fiddlers would be performing 11:45 – 1:15, and we got to the right spot at 1 pm on the dot, they were already finished and packing up their things. Too bad – I was disappointed. Thankfully, we had Food Trucks to cheer us up. My YYC Food Trucks app told us that Alley Burger was parked down at Eau Claire, so we hoofed it down there to grab a couple. Good thing we walked so fast! After we ordered, the woman at the till told the next customer there were only four left. We were starved, and so glad to have our burgers and fries. We walked back to TD Square to sit and eat them. A touch-up for my haircut at Ginger Group and a latte from Caffe Rosso were the perfect end to our adventure. 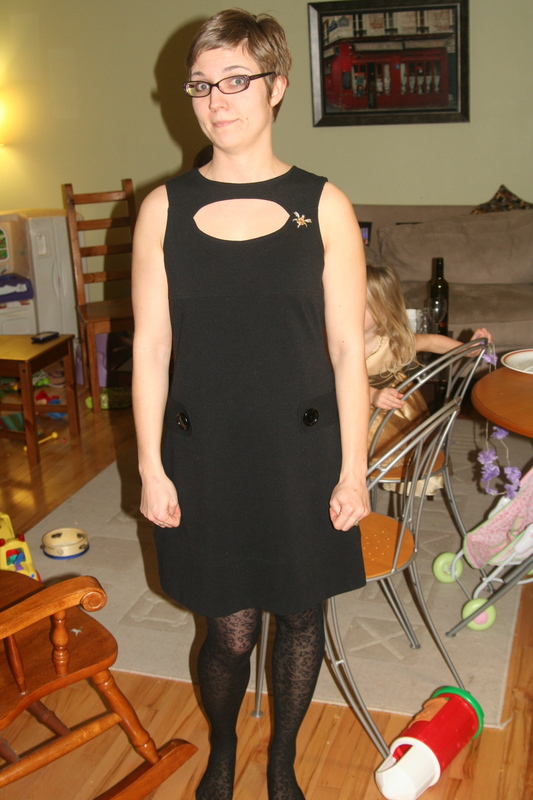 Tonight, we attended a Christmas party at a friend’s house, and I donned Dress #2 of the day. It’s too big – I nabbed it at a clothing swap earlier this month because I think it’s cute and I wanted another dress for Dressember.